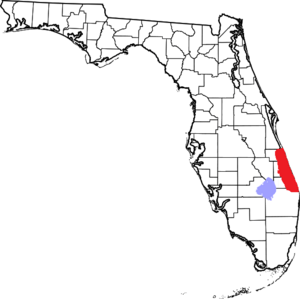 The Treasure Coast is a region of the U.S. state of Florida. It is located on the state's Atlantic coast, comprising Indian River, St. Lucie, and Martin, and in some definitions, Palm Beach counties. The region, whose name refers to the Spanish Treasure Fleet lost in a 1715 hurricane, evidently emerged from residents' desire to distinguish themselves from Miami and the Gold Coast region to the south. The area includes two metropolitan statistical areas designated by the Office of Management and Budget and used for statistical purposes by the Census Bureau and other agencies: the Port St. Lucie, Florida Metropolitan Statistical Area (comprising St. Lucie and Martin counties) and the Sebastian–Vero Beach, Florida Metropolitan Statistical Area (comprising Indian River County). Palm Beach county is part of the Miami-Fort Lauderdale-West Palm Beach, FL Metropolitan Statistical Area. The area has long been inhabited, but like other of Florida's vernacular regions, a popular identity for the area did not emerge until the area saw its initial population boom in the 20th century. It is one of several "coast" regions in Florida, like the Gold Coast and the First Coast. The term was coined by John J. Schumann Jr. and Harry J. Schultz of the Vero Beach Press Journal newspaper shortly after salvagers began recovering Spanish treasure off the coast in 1961. The discovery of treasure from the 1715 Treasure Fleet, lost in a hurricane near the Sebastian Inlet, was of major local importance and brought international attention to the area. Press Journal publisher Shumann and editor Schultz noted that there was no name for their area, which was between the well known Gold Coast (Palm Beach to Miami to the south) and the Space Coast (Brevard County to the north). They started referring to their region as the "Treasure Coast" in the newspaper, and this use spread to the community. Though some local businesses were using the term as early as 1966, it spread fairly slowly. The Miami Herald's 1972 Florida Almanac refers to the area from Miami to Vero Beach as the "Tropical Coast". A 1982 survey of Florida's vernacular regions by geographers Ary J. Lamme and Raymond K. Oldakowski did not include the "Treasure Coast". The survey showed that the entire area from Dade County (now Miami-Dade) north to Martin County was considered the "Gold Coast" at that time. However, a 2007 survey by the same authors found that by then the "Gold Coast" was restricted primarily to Miami-Dade and Broward counties, while the "Treasure Coast" region had emerged describing the area from Palm Beach County northward. Lamme and Oldakowski noted that by that time, "Gold Coast" had acquired some unflattering connotations. They suggest the communities to the north may have seen the need to distinguish themselves from the Gold Coast and Miami to promote their locale as a destination for American tourists and residents, contributing to the current popularity of the Treasure Coast as a vernacular region. The Anthony J. Catanese Center for Urban and Environmental Solutions at Florida Atlantic University notes that the Treasure Coast is becoming increasingly continuous with the rest of South Florida, with much of its current and projected development being tied to growth in the urban Miami metropolitan area. Lamme and Oldakowski found that the Treasure Coast comprises the area from Palm Beach County north to the Space Coast (including Palm Beach, Martin, St. Lucie, and Indian River counties). They note, however, that Palm Beach County remains part of South Florida and the Miami metropolitan area. The Treasure Coast Regional Planning Council, based in Stuart, uses a similar definition and has jurisdiction over these four counties. Other sources exclude Palm Beach County. A report by the Catanese Center lists the Treasure Coast, including only Martin, St. Lucie, and Indian River counties, as a subregion of the wider South Florida economic region. The Port St. Lucie, Florida Metropolitan Statistical Area, consisting of Martin and St. Lucie counties. Port St. Lucie is designated as the principal city. The two-county metropolitan statistical area was first defined in 1983 as the Fort Pierce Metropolitan Statistical Area. In 1993, the MSA was renamed the Fort Pierce-Port St. Lucie Metropolitan Statistical Area. In 2006, Fort Pierce was dropped as a principal city and the name was changed to its present form. The Sebastian – Vero Beach, Florida Metropolitan Statistical Area, which is coextensive with Indian River County. Sebastian and Vero Beach are designated as the principal cities. All of the Treasure Coast is shielded from the Atlantic Ocean by narrow sandbars and barrier islands that protect the shallow lagoons, rivers, and bays. Immediately inland, pine and palmetto flatlands are abundant. 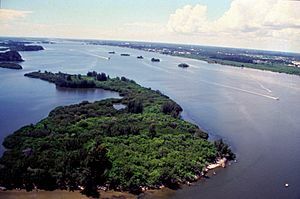 Numerous lakes and rivers run through the Treasure Coast, notably the well known Indian River, a part of the Indian River Lagoon system. At certain seasons of the year, bridges may impede the red drift algae flow, causing a "rotten egg" hydrogen sulfide odor in the area. The Treasure Coast is also bordered by the Atlantic portion of the Intracoastal Waterway, a stretch of closed water from Brownsville, Texas to Boston, Massachusetts. A great amount of the Treasure Coast's population is made up of census-designated places (CDPs), with almost all of these in Martin County and Indian River County. Only one city on the Treasure Coast has a population of more than 100,000 inhabitants, which is Port St. Lucie in St. Lucie County. Here is the classification of the places of the Treasure Coast. C for city, T for town. Treasure Coast Facts for Kids. Kiddle Encyclopedia.